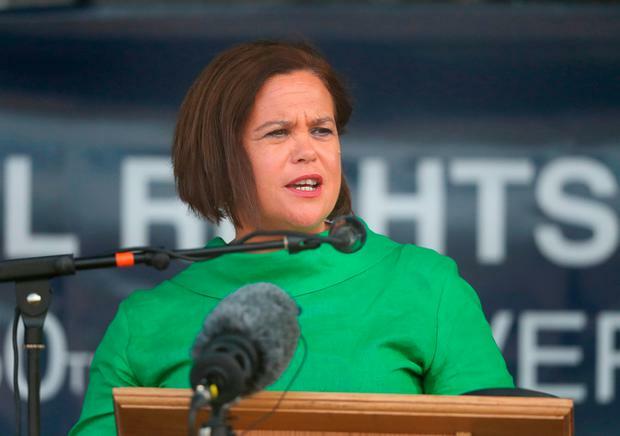 Sinn Féin leader Mary Lou McDonald has doubled down on her Irish reunification U-turn, saying a unity referendum is now at the centre of political discussion. The comments come a week after Ms McDonald said a poll on Irish unity should not be held while uncertainty around Brexit remains. She made the remarks during her keynote speech at the 37th annual National Hunger Strike Commemoration in Castlewellan, Co Down. Ms McDonald added that the Government here had a responsibility to lead the discussion. The Sinn Féin leader added that the party was committed to re-establishing the Executive and Assembly in Northern Ireland. “The Irish and British governments have said there will be a new round of talks in the autumn. That is welcome. “However basic rights, respect and equality cannot be disregarded, they are not bargaining chips. They are for all in society,” she said. “Marriage equality, the right to inquests and language rights are for everyone. Ms McDonald added that there were more republicans across Ireland now than at any time since partition. The Sinn Féin leader drew ire when contradicting herself on the issue of the Border earlier this week. Ms McDonald said on Monday last that while the “dangers” posed by Brexit were present, it was not the time for a Border poll. The following day, Ms McDonald said that if there was to be a hard Brexit next year, the British government would have to hold a Border poll. Both Fianna Fáil and Fine Gael seized on the apparent abrupt U-turn, questioning what prompted Ms McDonald to suddenly change her view. Justice Minister Charlie Flanagan said Ms McDonald’s U-turn “indicates the ‘hard men’ are not far away”.